It’s not easy to find an inexpensive restaurant in Amsterdam. (Read more about Prices in Amsterdam) Alternative eateries have popped up to fill the gap between home cooking and eating out in Amsterdam. People enjoy eating out in Amsterdam and they will find a way to do it: a €5 organic meal in a squat, an entertaining dinner on a boat, or bringing your own food to the bar. People who started cooking for friends in their own living room have made a real business out of their passion, turning their private residence in Amsterdam into a small restaurant. The phenomenon of these ‘living room restaurants’ (huiskamerrestaurants) has proved its success. Friendly, cosy homes become full fledged restaurants a couple of nights a week where people have to reserve to have that special relaxed, intimate feeling of a home cooked dinner party with friends. Way back in 2001, when she was a student at the University of Amsterdam, Saskia enjoyed cooking for her fellow students. Twice a month, the living room was emptied and adjusted to fit a group of people, while Saskia worked herself into a sweat in the small -typically Amsterdam- kitchen. Saskia’s passion for home cooking turned out to be stronger than her interest in a career in political science and after her studies, she decided to start her own home cooking restaurant. Saskia working in her kitchen in Amsterdam. With her parents’ and friends’ helps, Saski set up her own place in the Amsterdam Pijp neighbourhood. Most of time Saskia is booked full with groups and reservations are always in order. December especially is a busy month. But Saskia still organises her old “come sit at our dinner table”-dinners, when you are invited to sit side by side with other guests and strike up a conversation with a stranger if you like. You can find a list of the dates of these so called ‘aanschuifavond‘ at Saskia’s home cooking restaurant on the website. 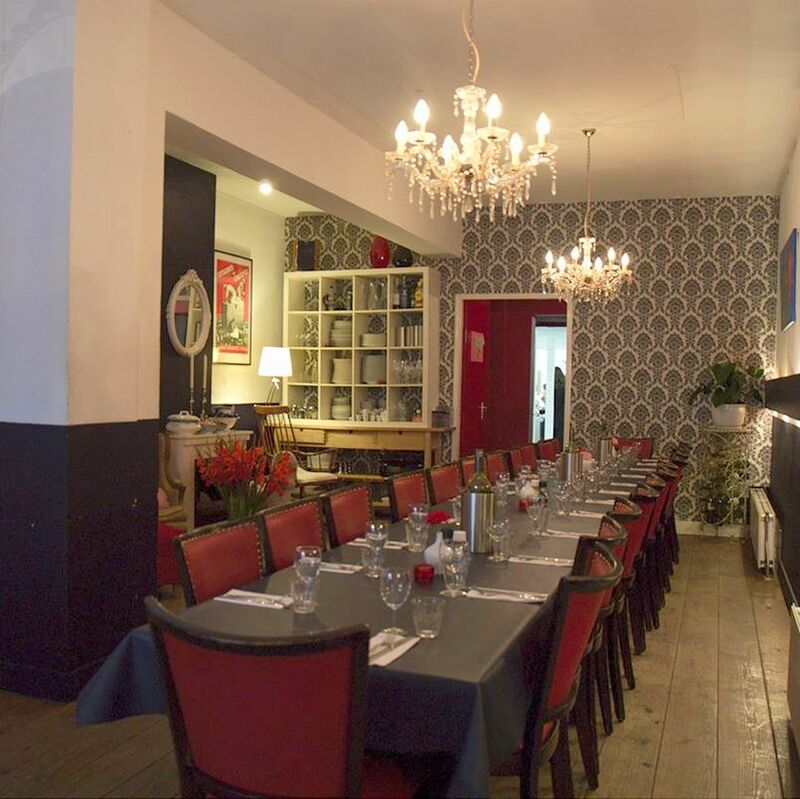 A 4-course dinner at Saskia’s living room restaurant is €39,- including drinks. Marit’s living room restaurant in Amsterdam. Marit Beemster choose to back away from her career as a fashion designer to pursue another of her passions: cooking. Since 2011, Marit welcomes guests into her own home. Only three times a week, to have some privacy left. Obviously, her background as a designer has left a mark on her ‘restaurant’. The homey feel of her living room is the result of a long search in antique stores, bric-a-brac shops and second hand markets, which makes eating out at Marit’s Amsterdam restaurant an intimate yet stylish experience. Marit only cooks vegetarian dishes. She want to show that vegetarian meals can consist of more than just goat’s cheese salad with honey and a veg ravioli. Marit calls her cuisine eclectic, a mix of Italian, Moroccan and Turkish with purely organic and seasonal ingredients. Marit can serve up to 24 people in her living room restaurant. Marit’s huiskamerrestaurant is open from Thursday to Saturday. A 3-course vegetarian meal at Marit’s is €28. Lunch, dinner and special arrangements (combinations with canal boating trips) for groups up to 20 people. Though strictly speaking De Kookerij is not really a living-rooom restaurant. Located in the centre (Singel 317 ). Tel: +31(0) 20 – 419 85 85 or +31(0) 6 – 51 207 551. Every last Friday of the month, you can join for a meal at Caro’s living room. A 3-course home cooked meal is €17,50. Reservations necessary. Information: +31 (0)6 – 394 394 06. In Amsterdam North, across the IJ-water cooks Tinda a 4-course meal for €45,-, including wine and coffee. 020-6711728. IJ-Keuken serves to groups up to 20 people.